Bear with me, this short post is a bit nerdy, but I believe it provides an important set of principles to understanding the table as a static structure and the processes that underpin technology projects and change initiatives. 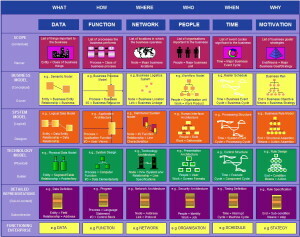 John Zachman developed his model from observing the way that ‘architectures’ are defined, specified and built, including big solid things like buildings and aircraft, but also the more elusive and intangible notion of the enterprise, why they exist, what they do and where, with what people and data etc. From the top of the model and following each column down are transformations, or reifications, from abstract ideas into instantiations. Zachman – and me to a much lesser extent – treats abstraction (Data/Inventory, Process, Location etc.) as real physical things to enable the whole DNA to be mapped out and described. As examples from the table of IT elements, Models as abstracts become Objects and Software when built. Strategy, through Projects and Change, results in Designed and Tested systems. Some concepts don’t easily fit into this framework, so I have bent the rules a bit, for example a Process or Jargon could live anywhere. 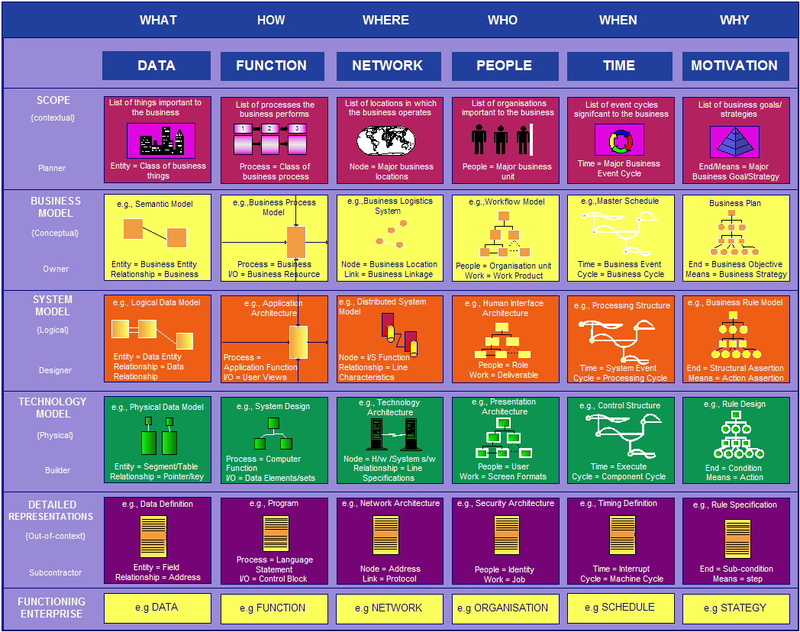 Zachman’s framework and my table are static structures or meta-models, models of models, they do not imply a process or methodology to create an enterprise, a piece of software, or a battleship. An architecture is a template on which something real – in fact many different things – can be built or realised. As well as the suggested top-to-bottom, left-to-right and random wanderings through the table – or more correctly the Model – there is one other important part of IT elements and related posts. Given a complete, ‘…descriptive representation’ (ibid) of the enterprise of interest, the power of hyperlinks and hot-tips allows more subtle comparison and contrast, as a hook or prompt for deeper and broader exploration. I have started to write some of these as small blog topics, but with imagination and an enquiring mind you will be able to find many more yourself.